Mozilla has just released the next version of one the most popular web browser i.e Firefox and it is available for everyone to download. Firefox 15 comes with some major features, two of which are the built-inÂ PDF files support andÂ Silent, background updatesÂ just like the Google Chrome. In this post we will talk about in-built PDF reader in Firefox which is unfortunatelyÂ disabled by default, but can be easily enabled by changing a small setting in about:config. Even though, Firefox 15 comes with in-built PDF reader, but is disabled by default. You need to enable the PDF reader support by changing a small setting. Just open about:config in your Firefox Â address bar and search for pdf string. You will find an entry named “pdfjs.disabled”. 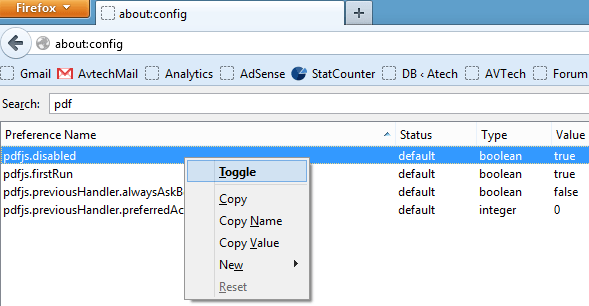 Just right-click on that string and click on the “Toggle” Â option from the menu. Using the toggle option and setting it to false instead of true, the in-built PDF reader is now enabled in your Firefox browser. You need to restart Firefox to start using the PDF reader. 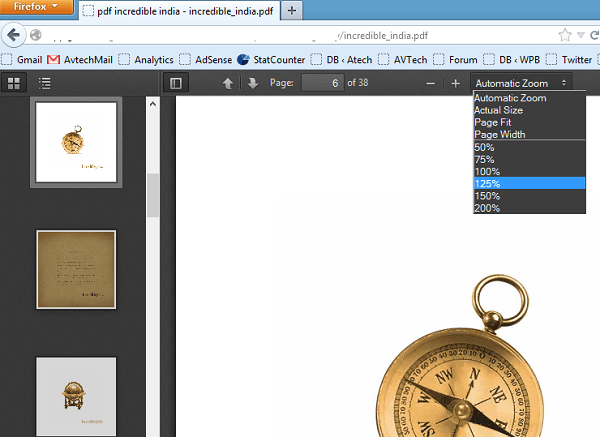 The inbuilt PDF Reader is just a simple PDF Reader with minimal features necessary enough to read PDF files inside the browser. Some of these minimal features include ability to Zoom in & out, thumbnail view, page views and the option to download the file on your PC. Keep in mind that this feature is onlyÂ availableÂ if you are using Firefox version 15 or above. If you have not upgraded, you can download Firefox 15 from the download links below.